In this article we will learn the basics of XSLT mapping. 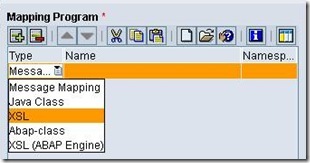 SAP PI supports four types of mappings like plain graphical mapping, Java mapping, ABAP mapping and XSLT mapping. We will understand when to use XSLT mapping and learn the pros and cons of using XSLT in SAP PI. XSLT stands for Extensible Stylesheet Language Transformation. It is an XML based language for transforming XML documents into any other formats suitable for browser to display, on the basis of set of well-defined rules. Using XSLT we can transform XML to XML, Text, HTML/XHTML, PDF etc. To understand XPATH in further detail, read XPATH Tutorials. When to use XSLT mapping? An example could be – say you are receiving an xml consisting of list of PO items and you need to sort and group these items as per the PO numbers, at the same time separating header and item level information. File content conversion at receiver side can be avoided in case of text or html output. You can easily segregate and group source data from flat structure to deeply nested structure and vice versa. Achieving this using graphical mapping is possible, however would take more development effort. Resultant XML payload can not be viewed in SXMB_MONI if not in XML format (for service packs < SP14). Interface mapping testing does not show proper error description. Errors in XSLT programs are difficult to trace in PI but can be easily identified outside PI using browser. XSLT mapping requires more memory than mapping classes generated in Java. So should be avoided when parsing very large source XML documents. I will explain the manual method of testing an XSLT program: Open your source XML file and insert the following line immediately after the first line so that it looks like below. Change the path of XSL file accordingly. Now open source xml file in browser. This will show you transformed output and not the actual source xml file. This method however will not display the XML tags. You will only see the content of the XML elements. To see XML tags you will need one of the software listed above or similar ones. Note: <xsl: stylesheet> and <xsl: transform> are completely synonymous and either can be used. An XSL style sheet consists of one or more set of rules that are called templates. Each template contains rules to apply when a specified node is matched. The <xsl: template> element is used to build templates. The match attribute is used to associate a template with an XML element. The match attribute can also be used to define a template for the entire XML document. The value of the match attribute is an XPATH expression (i.e. match=”/” defines the whole document). The <xsl:value-of> element can be used to extract the value of an XML element and add it to the output stream of the transformation. The <xsl:for-each> element allows you to do looping in XSLT. The XSL <xsl:for-each> element can be used to select every XML element of a specified node-set. The <xsl:sort> element is used to sort the output. To sort the output, simply add an <xsl:sort> element inside the <xsl:for-each> element in the XSL file. The <xsl:if> element is used to put a conditional test against the content of the XML file. To put a conditional if test against the content of the XML file, add an <xsl:if> element to the XSL document. The <xsl:choose> element is used in conjunction with <xsl:when> and <xsl:otherwise> to express multiple conditional tests. There are a number of XSLT elements. Please go through this article for details. W3Schools website has good examples to understand each of these elements. Study these XSLT Examples to gain better understanding. Define source and target data types. Design an XSLT mapping for source to target type using the various XSLT elements available. In case it is not possible to design the XSLT mapping on our own, use XSLT mapping tool like Stylus Studio to create the desired XSL file. Compress the XSL document created above into a .ZIP or .JAR Archive file. The file name (including path) of the archive must not be longer than 180 characters. Import the above generated ZIP or JAR Archive into IR/ESR under Imported Archives. Specify the name and namespace and other information. Use the Import Archive option and import the ZIP/JAR file created previously. Name of the XSL file would be visible under the Archive Program section. Save and activate the changes. Now define the Interface Mapping. Specify source and target message interfaces and click on Read Interfaces option. Under the Mapping Program section, select the Type as XSL. Use the Search Help to specify the XSLT mapping program. Choose the XSL file imported previously and click OK. Save and activate the changes. I am having a peculiar problem. I need to use xslt provided by third party. The zip package contains couple of xsd and xml files which the xsl reads using select=”Document(‘filename’)”. But when I import the archive and test the xsl inside operation mapping, I get exception that the document ‘filename’ could not be found in path. The file ‘filename’ is inside the archive itself. I tried giving ‘./filename’, ‘archivename/filename’. But it didn’t work. The xslt works perfectly fine with msxsl. Any idea how to use select=”Document inside PI xslt mapping?